20 Great Small Towns to Explore Near Washington, D.C. The Washington, D.C. area has a variety of small towns with great restaurants, shopping, recreational activities and cultural attractions. Visit these 20 towns and enjoy a wide range of architecture, historic landmarks, museums, arts and entertainment districts and more. Learn about the top attractions and what makes each destination unique. St. Michaels is one of the best destinations on the Maryland Eastern Shore for sailing, bicycling and eating freshly-caught crabs and oysters. The coastal town is a popular place to visit and has a variety of gift shops, restaurants, inns and bed and breakfasts. The Chesapeake Bay Maritime Museum displays Chesapeake Bay artifacts and features programs about maritime history and culture. Visitors can take a cruise on a Skipjack, tour a brewery, distillery and winery, go fishing or explore historic landmarks. 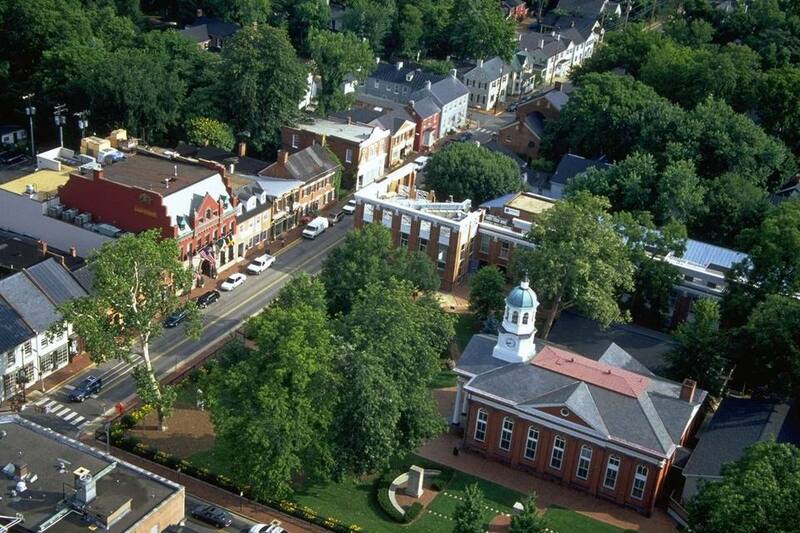 Fredericksburg, Virginia is a charming historic town that was the childhood home to George Washington, a major port during the colonial era and the site of major battles during the Civil War. The historic district contains 350 original 18th and 19th century buildings and is home to many living history museums, restaurants, shops, and art galleries. Read more about Fredericksburg, VA.
Best known for its Civil War history, Gettysburg, Pennsylvania is a quaint town with a wide range of attractions and activities. While there are numerous interactive tours and ways to learn about the Battle of Gettysburg, visitors also enjoy the great antique shops, art galleries, restaurants and exploring the Pennsylvania countryside. Read more about Gettysburg, PA.
Harpers Ferry is a historic landmark in Jefferson County, West Virginia, just an hour's drive northwest of Washington, D.C. The area is known for John Brown's attack on slavery and the largest surrender of Federal troops during the Civil War. West Virginia, Maryland, and Virginia merge at Harpers Ferry National Historic Park. Visitors can enjoy a variety of scenic hiking trails and explore the historic town which offers ranger-guided tours, museums, restaurants and craft shops. Read more about Harpers Ferry, WV. Cambridge is a small historic town on the Eastern Shore of Maryland. Located just 90 miles southeast of Washington, D.C., the waterfront community features brick paved streets with shops, restaurants, parks, a marina, museums, and a lighthouse. The area attracts nature lovers, birders, photographers, cyclists, and paddlers to explore the Blackwater National Wildlife Refuge. In 2017, the Harriet Tubman Underground Railroad National Historic Park will open providing the public with a wide range of experiences to learn about the extraordinary history of the abolitionist movement in this region. Read more about Cambridge, Maryland. Located in the Shenandoah Valley region of Virginia, Winchester has a four block pedestrian only historic district with unique shops, restaurants, and architecture. The famous George Washington Hotel is an elegant place to stay with its convenient location in the heart of Old Town. The area offers a wide variety of recreation opportunities within an easy drive. Old Town Winchester is the artistic hub of the region with concerts, plays, operas and other cultural events throughout the year. Read more about Winchester, VA.
Leesburg, Virginia, the county seat of Loudoun County, served as a commercial center for the region during the days of early settlement. Today, the historic district is a popular destination for fine dining, antiquing, shopping, and recreation. Visitors travel to the area from around the region to shop at the Leesburg Corner Premium Outlets, to visit the nearby wineries and to attend a variety of seasonal events. Lansdowne Resort offers luxury accommodations and an ideal destination for a family gathering or business meeting. ​Read more about Leesburg, VA.
Ellicott City is a historic town in Howard County, Maryland that is home to the oldest railroad station in the U.S. and the last operating grist mill in the state. Located 11 miles west of Downtown Baltimore, the town offers a unique destination for shopping and dining. Although Ellicott City was severely damaged in a historic flood in August 2016, the town is working toward reopening many of its attractions. Call ahead to check with the specific site before planning a visit. Read more about Ellicott City, MD. Berlin is a small town in Worcester County, Maryland. It is approximately 7 miles from Ocean City and is the closest town to Assateague Island National Seashore. The town’s Main Street was originally part of the path that connected the Assateague Indians with the neighboring Pocomoke tribe. Today, Berlin is home antique shops, art galleries and restaurants and has 47 structures that are listed on the National Register of Historic Places. Unique recreational activities in the area include journeys into calm streams and peaceful marsh lands. Herring Creek Nature Park, a 5 acre nature trail, is the ideal place for bird watching. Frontier Town is a popular family amusement site and water park. The small town on the banks of the Chester River was an important port of entry for early settlers to Maryland. Today, Chestertown is the county seat of Kent County and has a growing arts and entertainment district. It is a fun place to explore with many restored colonial homes, churches, and a variety interesting shops and restaurants. The Chestertown Tea Party Festival is one of the many family friendly events that attracts visitors from around the region. Eastern Neck Wildlife Refuge is a 2,285 acre island providing habitat for thousands of wintering waterfowl. The area is also home to Washington College, the tenth oldest college in the United States. Located on the Maryland Eastern Shore along Route 50 between Annapolis and Ocean City, Easton is a quaint historic town with great shops and restaurants. The Tidewater Inn is an historic property that offers luxury accommodations and prime event space. Main attractions in town include the Academy Art Museum, Avalon Theater and the Pickering Creek Audubon Center. Although Easton is located inland, it has convenient access to the waterfront communities of St. Michael's and Cambridge. Manassas is an independent city near Prince William County, Virginia, located approximately 30 miles from Washington, D..C and a short drive from the scenic Blue Ridge Mountains. The area is best known for its Civil War history and attracts visitors from around the region to explore its historic sites and enjoy shopping at dozens of art, antique and specialty shops. Located in the heart of Virginia horse country, Middleburg is known for its natural beauty and equestrian activities. The town is interesting to explore as it is home to more than 160 buildings listed on the National Register of Historic Places. Popular attractions include Aldie Mill, Creighton Farms and the National Sporting Library and Museum. With an ideal climate for growing grapes, Middleburg also boasts more than 20 wineries within a short drive. The nearby Salamander Resort & Spa offers a luxury getaway destination and a wide range of activities for all ages. Set along the Occoquan River in Northern Virginia, the town of Occoquan was first settled by early colonists who relied on the river for transportation and trade. For more than 175 years, it served as industrial settlement with a grist mill and tobacco warehouses. Today, the town is an interesting place to explore and has antique shops, restaurants, and a boat dock. Read more about Occoquan, VA. Located in the heart of Virginia’s Shenandoah Valley, Downtown Staunton is known for its magnificently preserved architecture. The town features unique shops, art galleries and restaurants, along with the recently-restored Stonewall Jackson Hotel. Top attractions include the Blackfriars Playhouse, the Woodrow Wilson Presidential Library and Museum and the Frontier Culture Museum. Lexington is located in the center of the Shenandoah Valley region of Virginia and is home to Virginia Military Institute and Washington and Lee University. History buffs enjoy the Stonewall Jackson House, the George C. Marshall Museum, and Lee Chapel at Washington and Lee. A wide variety of outdoor recreation is available off the Blue Ridge Parkway and at nearby George Washington and Jefferson National Forests. The Virginia Horse Center provides year-around activities, such as major horse sales, competitions, equine events and instruction. Waterford is a small town in the Catoctin Valley of Loudoun County, Virginia, located along Catoctin Creek. The historic district is a National Historic Landmark and includes a variety of 18th and 119th century buildings including a mill, Arch House Row, Camelot School, the William Virtz House and the Catoctin Creek Bridge. The Waterford Fair is an annual craft fair that attracts visitors from around the region. © Cameron Davidson/Virginia Tourism Corp.
Chincoteague Island, a tiny fishing town at the northeastern tip of Virginia's Eastern Shore, is known worldwide for the wild ponies that live in the Chincoteague National Wildlife Refuge. The town is steps away from the Atlantic Ocean by bridge. The most popular event for the area is held each July when the Chincoteague Volunteer Fire Company's Pony Swim and Auction brings scores of spectators to watch cowboys rounding up ponies and swimming them across the channel from Assateague Island to Chincoteague Island for auction. Visitors enjoy kayaking, charter fishing and nature watching. Read more about Chincoteague, VA.
Nestled in the heart of Virginia's wine country, the charming town of Purcellville is home to a great selection of boutiques, restaurants, and Loudoun County’s first distillery since Prohibition. Numerous award-winning wineries are within minutes of the Historic Old Town area. Nearby attractions include the W&OD Bike Trail, Fireman’s Field ballpark, and Bush Tabernacle. Cumberland, the western gateway city and the seat of Allegany County, Maryland, offers small town charm that dates back to 1787. Major attractions include the C & O Canal National Park Visitor Center & Museum, the Allegany Museum, the Shops at Canal Place and Gordon-Roberts House. Nestled among the Appalachian Mountains, the town offers a convenient place to visit while enjoying outdoor recreation. Read more about Western Maryland.